To export to Gusto, you'll need to be a System Administrator or Location Manager. 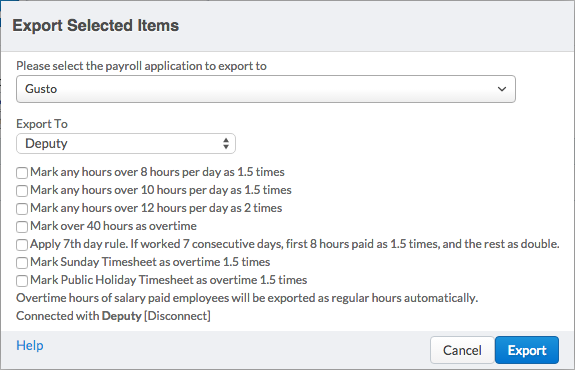 If you aren't, you will not see the option to "Export Timesheets". Before exporting to Gusto, please ensure that you have approved the relevant timesheets. 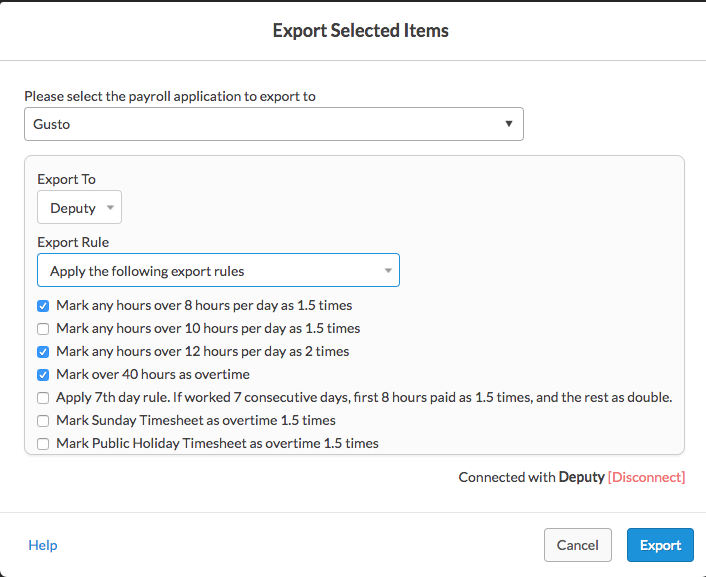 Gusto should automatically have the pay run setup for you at the time of the export, however, please double-check before exporting. Please ensure that you have a valid Gusto account before proceeding. To connect to your Gusto account, go to Location Settings for the location you would like to link. 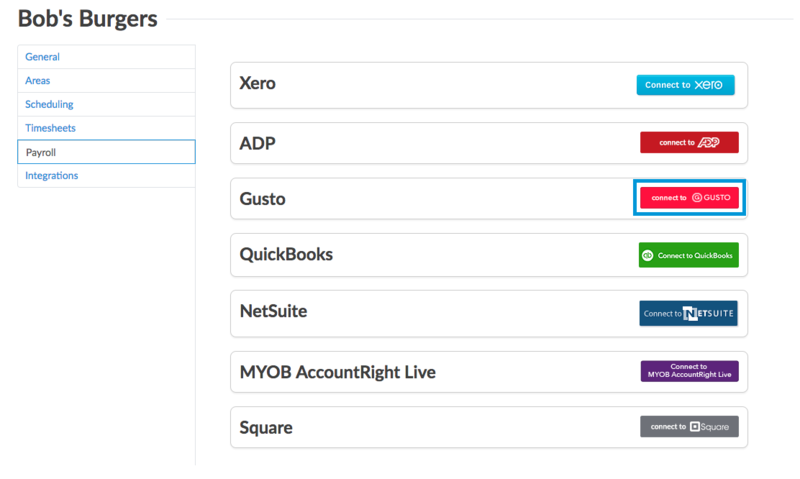 Click the 'Payroll' tab and click 'Connect to Gusto'. You will see the following screen. Enter your password to continue. 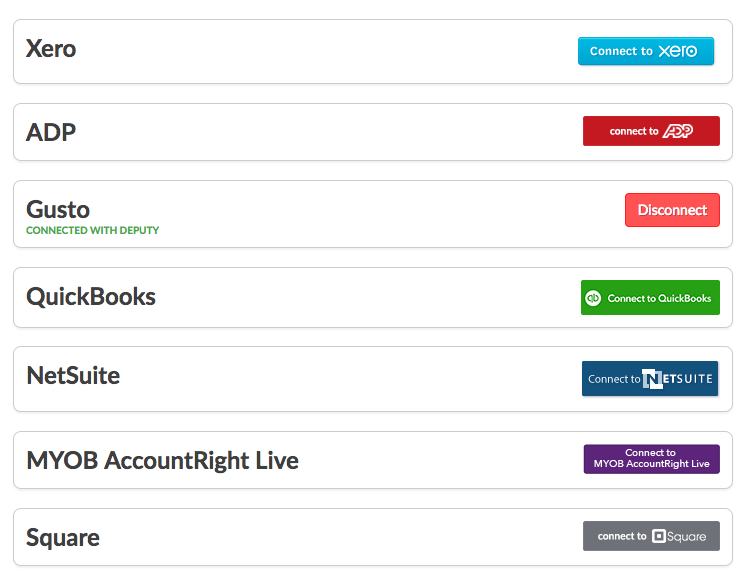 On the next page, click 'Authorize' to complete the connection. 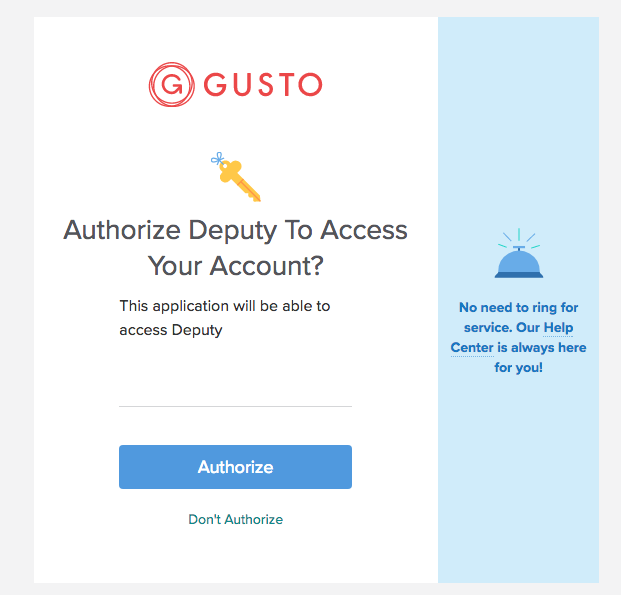 You will then be redirected to the Payroll tab in your Location Settings, which will confirm the connection between your Deputy and Gusto account. 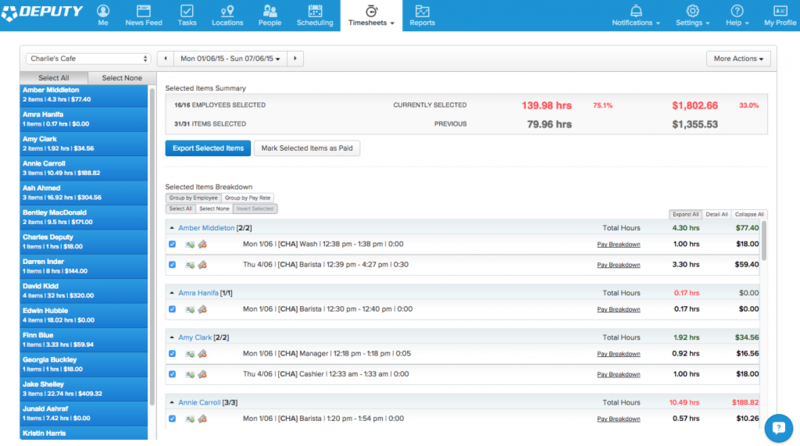 Please navigate to the Timesheets tab and select "Export Time Sheets". Select the date range for the export from the date selector at the top of the screen. Please select the employees to export on the left-hand side. To quickly select all employees click "Select All". The details will then be displayed on the right-hand side. If you need to edit an item, please click on the item in the list to the right and select "View or edit original item". Once you are ready to export, please click "Export Selected Items"
In the pop-up box, please select either Gusto or Gusto Demo, depending on your Gusto account. You will then see a "Connect" button. Please click it and choose the relevant account. You will now be asked to connect to your Gusto account. Please log in, then click "Authorise" to allow Deputy to export to Gusto. You will now be redirected to Deputy. Next, please select the overtime rules that apply to your company. Finally, please click "Export" to send the timesheet data to Gusto. Please note: We do not allow exporting of any non-default leave types. To do this, simply apply these award rates to your employees. To learn how to do this, click here. Please note that if you have changed any employee rates, that you will need to unapprove and reapprove and relevant timesheets. Now click 'Group by Pay Rate'. 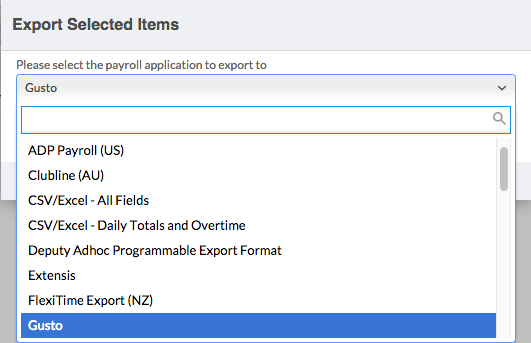 The export code must exactly match the earning type/pay rate title in Gusto. 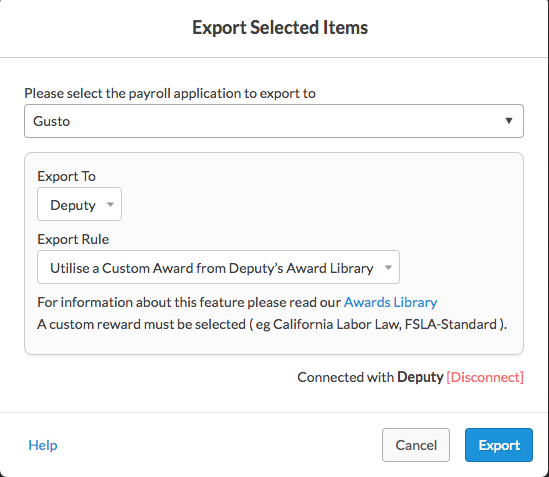 When exporting your employees, in the dialog box, select 'Utilise a Custom Award from Deputy's Award Library' under the 'Export Rule' option. 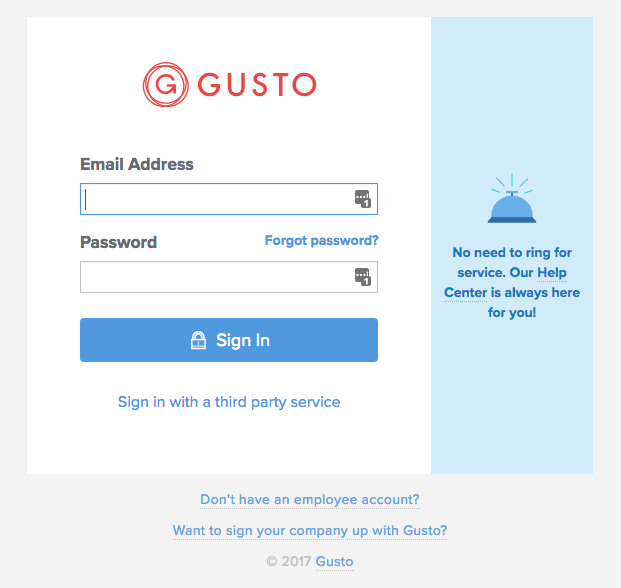 To add employees from Gusto to Deputy, please ensure that the Gusto integration is turned on. For more instructions on how to do this, click here. Now log into your Gusto account, then click the 'People' tab. Now click the 'Hire' button'. Then click 'Add an Employee'. 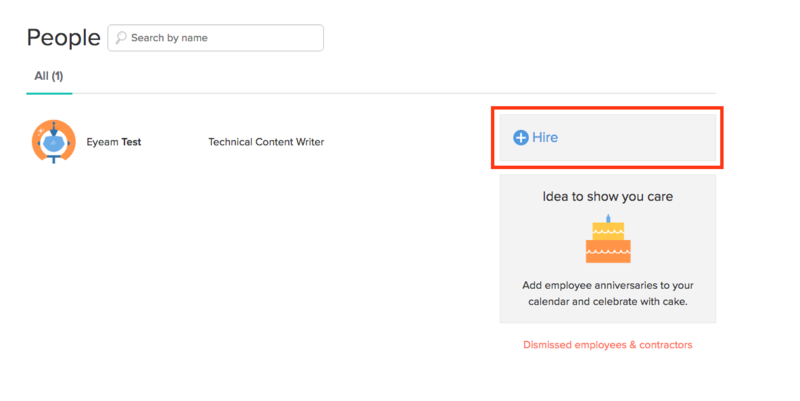 Now follow the prompts to add your employees. Gusto's export matches the employee's name in Deputy. Please make sure that the names match between the two. The matching is case-sensitive. Please note that you cannot export contractors to Gusto. To ensure a successful export, you will need to make sure the job code within Gusto matches the employee's Area Export Code within Deputy. You can match the Gusto job code to Deputy, or vice versa, but preference is given to the Area Export Code in Deputy. You will need to extract the matching job ID for each area. If none are found, use the first one for the employee.